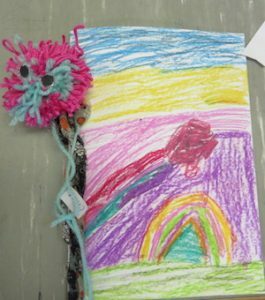 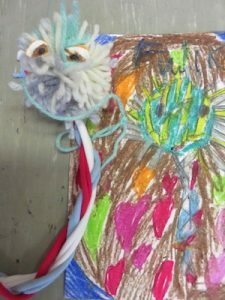 Ms. Fidalgo suggested we work with Fabric and Fibre, so we began by looking at the fabrics we were wearing now during the winter weather. 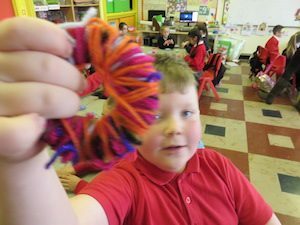 We looked at the texture of our woolly hats and woven scarves. 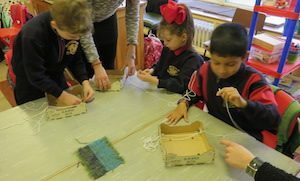 We explored how these fabrics were made. 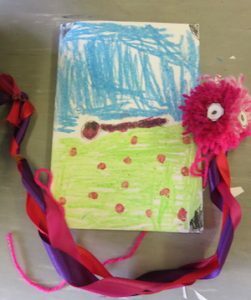 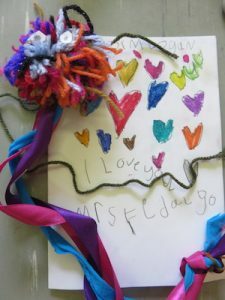 We looked at the knitted patterns in our hats, the pompoms and the woven pattern of our scarves. 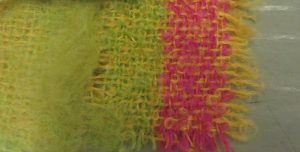 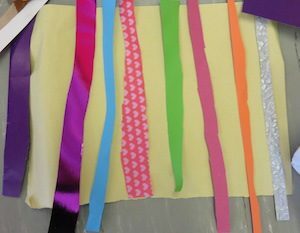 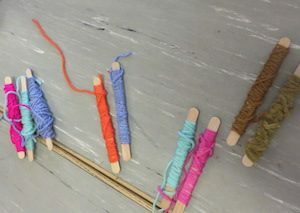 We set out to learn some skills to create some of these textures; weaving, wrapping, knotting, and cutting fabric. 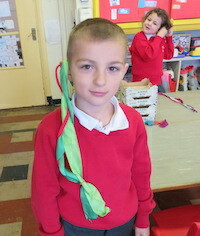 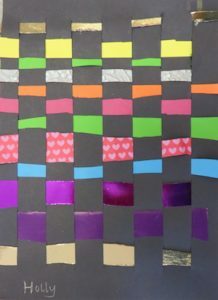 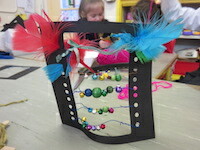 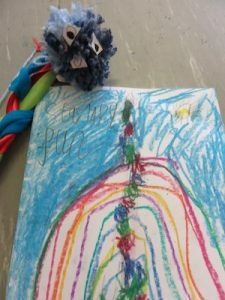 Using paper the children chose the colours to weave with and cut them into long strands. 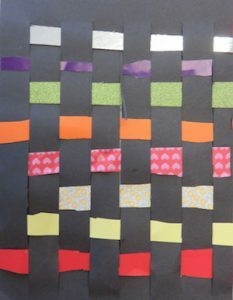 I had cut black paper to use for the warp. 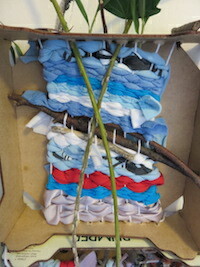 While they were weaving all you could hear was the murmur of under, over, under. 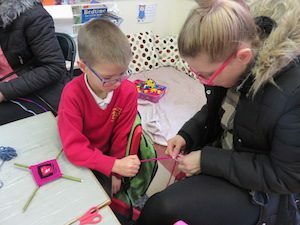 It was lovely to see the children spot their own mistakes in the pattern and going back to solve it. 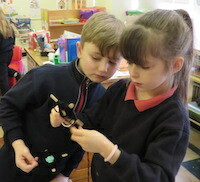 They were very pleased with their work. 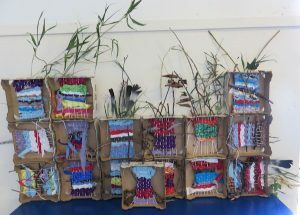 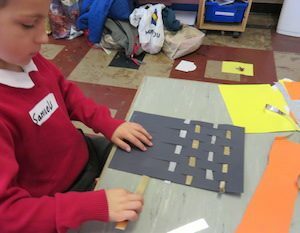 The children made looms from fruit boxes. 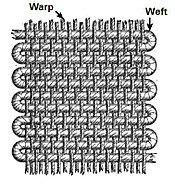 Here they prepare the wrap using string. 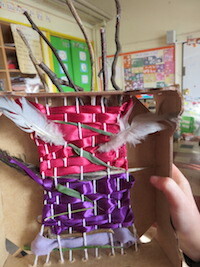 I decided that we should try out other skills before embarking on our weaving. 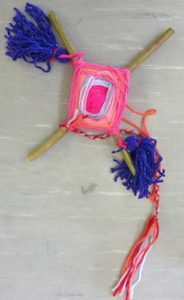 Wrapping Sticks and Making Pompoms. 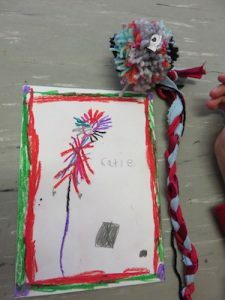 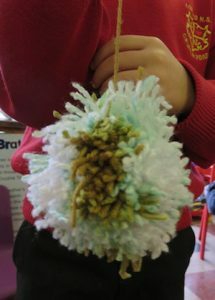 The children wrapped the coloured wool on to lollypop sticks to prepare for making pompoms. 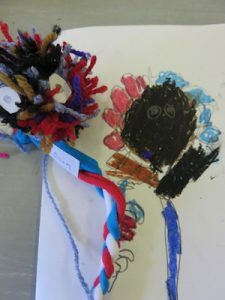 They decided that the pompoms looked like heads. 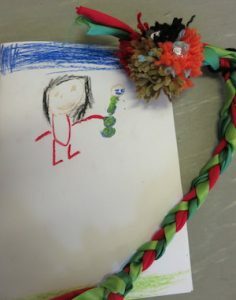 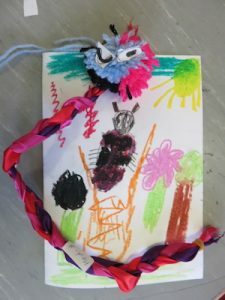 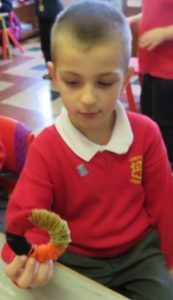 They used paper to give them faces and put them together with their plaited fabric to give them long tails and made lovely creatures. 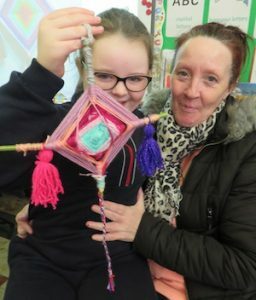 This was our last session before Christmas so they wanted to give them as presents. 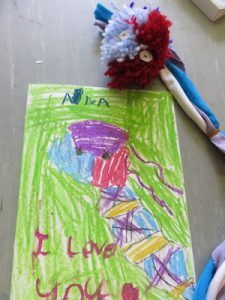 They made lovely cards on which they drew portraits of the creatures and gave them names. 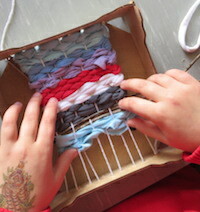 After Christmas we went back to our looms. 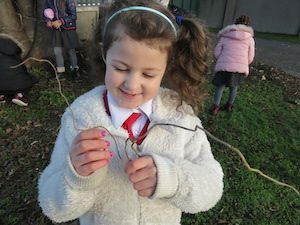 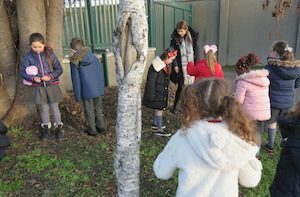 The children collected long natural objects in the school yard to weave with. 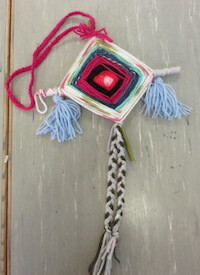 A God’s eye (Mexican weavings. 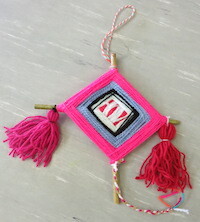 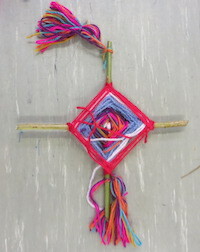 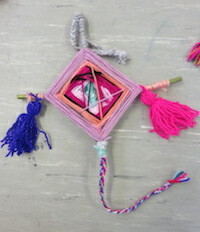 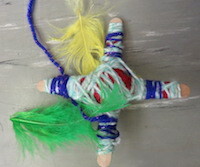 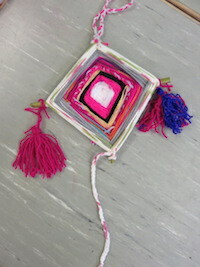 In Spanish, Ojo de Dios) is made by weaving a design out of yarn on a wooden cross. 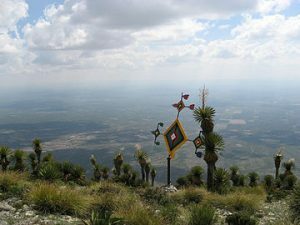 The spiritual eye of the Ojos de Dios is thought by some believers to have the power to see and understand things unknown to the physical eye.These were placed where people worked, or where they walked along a trail to keep them safe. 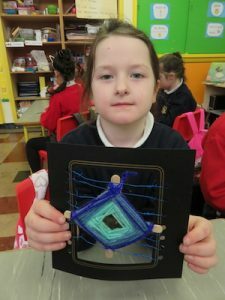 This is very skilled work and I though it might be a bit ambitious but so far the children enjoyed all the challenges of the skills they were learning. 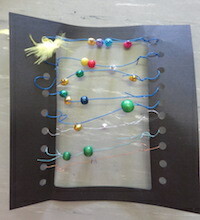 At the same time I gave out card frames with holes along the sides and a variety of materials, ribbon, beads, wire and feathers, so they could create work while I had time to go to each table to show the techniques for God’s Eye weavings. 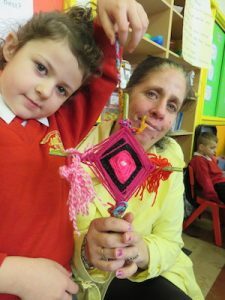 Once children learnt to weave on the cross they taught others. 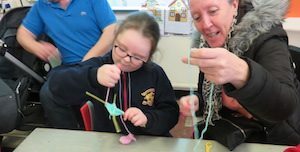 On our final session we invited the parents/grandparents/guardians to join us. 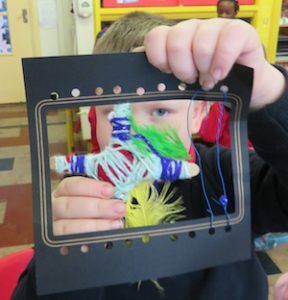 I showed a slide show of all the work we had been doing and the children described so well what was in each slide.It was amazing to look back and see how much the children had learnt. 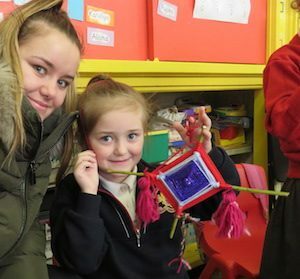 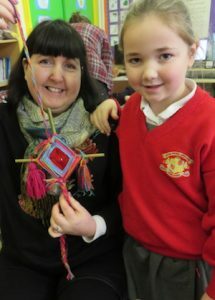 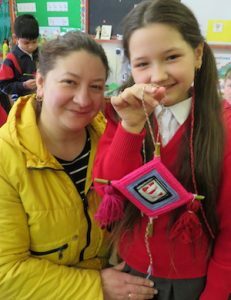 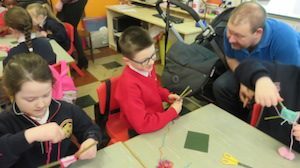 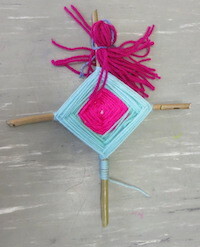 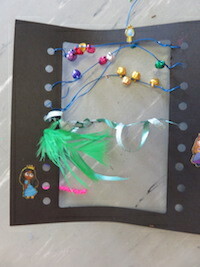 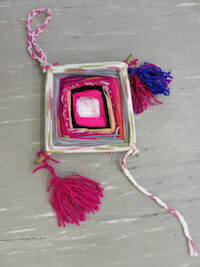 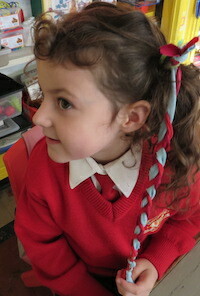 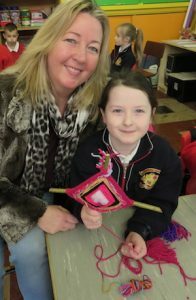 The children taught their parents how to make God’s Eye weavings, how to plait and we all learnt how to make tassels.